Bayes | Less than personal. For a while now, I’ve been involved in Kuramoto models and adjusting them to data. Recently I’ve stumbled upon using Bayesian inference on predicting parameters in time-evolving dynamics. Team from Physics Department at University of Lancaster has produced many papers, but to provide with some reference it might be worth to look at . Technique refers to general phase dynamics in oscillator, i.e. Rewrite model in form of , where is parameters vector, provides significant terms (for example via Fourier decomposition) for our model and is a vector of all oscillators’ phases (at some moment). Calculate diagonal values of Jacobian matrix, i.e. .
Set a priori probabilities for parameters vector and its covariance (or concentration ). Then the problem is reduced to finding maximum of minus log-likelihood function S. Authors also provide the exact formulas and algorithm, which find the extremum. Tutorial on applying their algorithm can be found in . which means there are 12 parameters – three intrinsic frequencies ( ) and 3×3 K matrix representing coupling between pairs of oscillators. To each oscillator small Gaussian noise was added (mean 0 and standard deviation 0.01). Signals were generated for with sampling step . Furthermore, analysis was performed on 8 s segments with 2 s step. 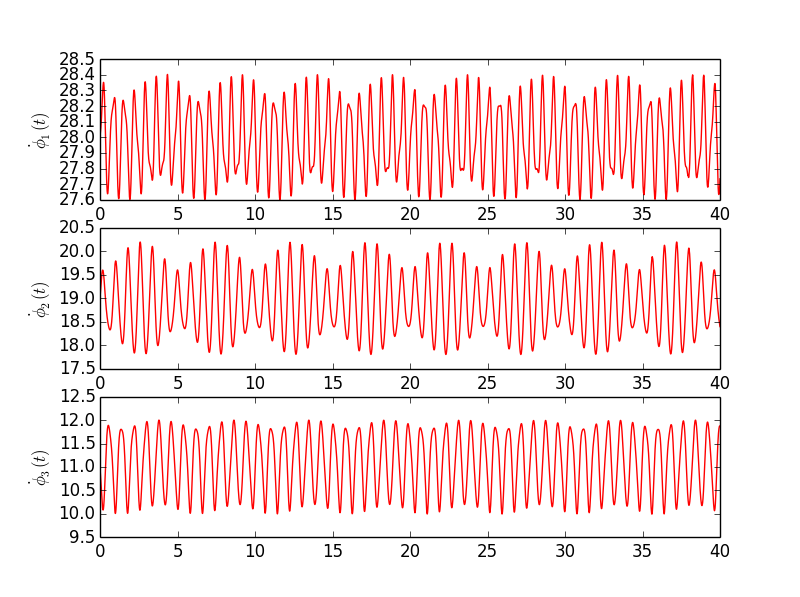 Figure 1 shows instantaneous frequencies ( ) for each oscillator. Figure 2 presents calculated parameters for each segment (thus time dependency). To be honest, I am quite surprised how good this technique works. I have performed more experiments, but to keep it short I am posting just one. There are some fluctuations in obtained values, but those changes are very small and most likely, in practical sense, negligible. Fig. 1. Instantaneous frequencies of all oscillators in experiment. Fig. 2. 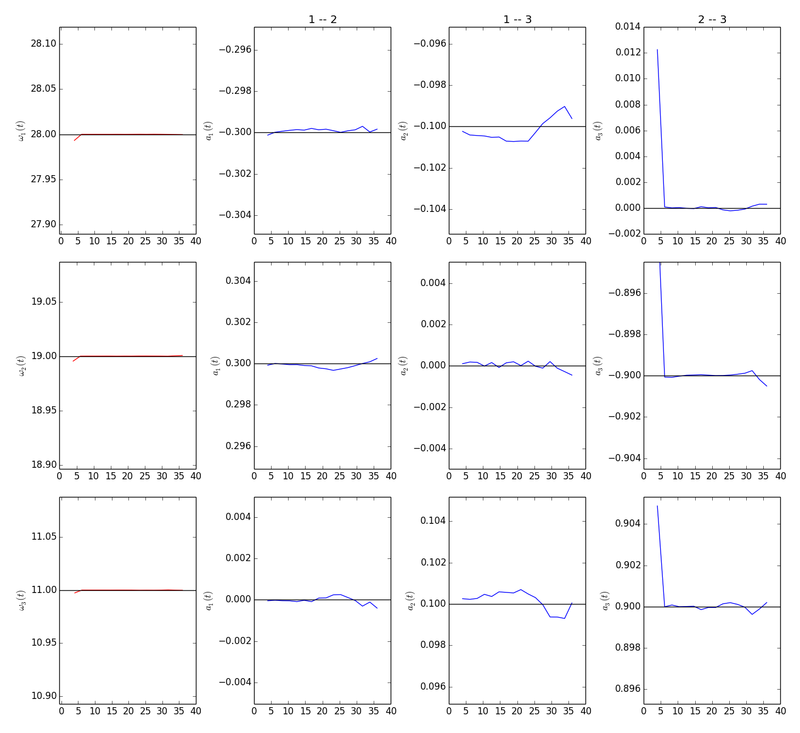 Extracted parameters for presented dynamical system. First column shows values on intrinsic frequencies and the rest respective to title coupling value. Horizontal black lines indicate what are expected values. A. Duggento, T. Stankovski, P. V. E. McClintock, and A. Stefanovska, “Dynamical Bayesian inference of time-evolving interactions: From a pair of coupled oscillators to networks of oscillators,” Phys. Rev. E – Stat. Nonlinear, Soft Matter Phys., vol. 86, no. 6, pp. 1–16, 2012. T. Stankovski, A. Duggento, P. V. E. McClintock, and A. Stefanovska, “A tutorial on time-evolving dynamical Bayesian inference,” Eur. Phys. J. Spec. Top., vol. 223, no. 13, pp. 2685–2703, 2014. Nonlinear Biomedical Physics, Lancaster University http://py-biomedical.lancaster.ac.uk/.